This is a just a base recipe which you can jazz up however you'd like. As is, it's straightforward and the cirtus vinaigrette really ties it all together. Some additional ingredients you can include in the salad are: ditalini pasta, sweet kernel corn, diced avocado, grilled chicken, steak or shrimp, crumbled blue cheese or feta cheese, black beans, etc. The possibilities are endless yet the results will definitely be delicious! 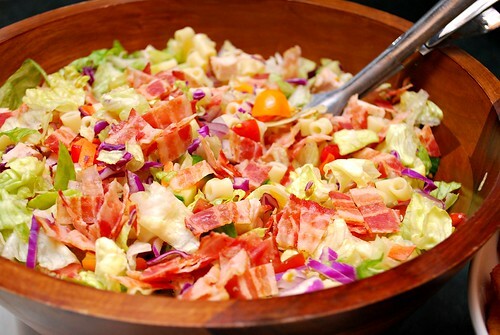 Place all the salad ingredients in a large serving bowl and toss to incorporate. In small bowl, add all the vinaigrette ingredients and whisk until well-combined and sugar is dissolved. Drizzle over the salad just before serving.